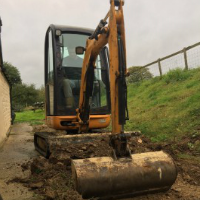 Based in Stroud, we offer Landscaping, Driveway & Groundwork services across Gloucestershire to both residential and commercial customers. Our team of experienced landscapers provide a personalised service to ensure the demands of our client are met. 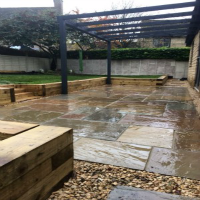 We provide the design and installation of landscape construction projects including patios, bespoke driveways, walkways, steps, retaining walls, turfing, decking, drainage systems and excavation. Click below to see all the services we offer. Landscape Construction is our passion, which shows in the quality finish produced in all of our projects. Our team of professional landscapers will transform your outdoor space. A well designed driveway can enhance the look of and provide the first impression to your property. 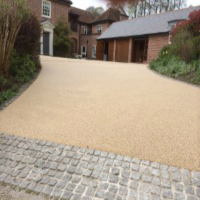 Our knowledge and expertise will create a driveway perfect for your property. From Foundations & Drainage to Bulk Excavations, SGS offer Groundworks services to both residential and commercial clients. Give us a call today to see if we can help. We are a local company specialising in Landscaping and Driveways. We take pride in our work and endeavour to complete on time and within budget. We are a local, family run business focused on 100% customer satisfaction. We offer free consultations for all of our services followed by a written quote. We are building an honest, friendly landscaping company which has been established since 2012. Our back garden and drvieway have been transformed! Thank you! The patio and steps that you laid for us exceeded our expectations. Highly recommended.